I think most of us would love to plant a Mimosa in their garden. In this post I’ve looked at the most popular Mimosa cultivars on the market. Just as with citrus fruits there are differences between the cultivars and species of Mimosa. Some Mimosas, as we’ve all seen around us, seem to do rather well even in our area. Again it is a question of choosing the right spot (wind-free/sunny) and the right type of Mimosa, one that is more suitable to our region. 1. Mimosas like acid soil, only Acacia retinodes will accept chalky soil, so plant your mimosa in acid soil. 2. There is no need to fertilise, they rather like poor soil and as they belong to the leguminosae family, they release nitrogen into the soil. 3. Prune them after flowering. Not to be bothered by their pods, cut off all the spent flower heads. The Latin name for Mimosa is Acacia. Acacia is a genus of around 1200 trees, shrubs, climbers. Their habitat ranges from Central to South America, southern part of Africa, Australia and Tasmania. In Australia and Tasmania alone, there are 800 species. The Acacia trees that we call Mimosa, originally came from Australia. It was Captain Cook, who brought seeds and plants back with him from Australia. The first Mimosa trees in the UK were acclimatised in Royal Kew Garden. Between 1830-1850 when some English started building sumptuous villas along the Mediterranean coast between Toulon and the Italian Riviera, they introduced the Mimosa tree to the region. 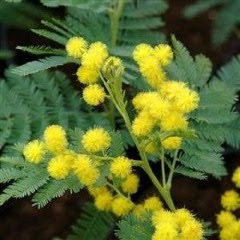 The first Mimosa introduced to the Alpes Maritimes was the Acacia farnesiana. Acacia dealbata was introduced in 1864 and its cultivars have become the principal mimosas where the cut flower industry is concerned. The following are the most popular Mimosas. Acacia Mirandole (-5C /-7C), A. Mireille (-5C/-7C), A. Rêve d’Or (-5C/-7C), A. Tournaire (-5C/-7C), A. Le Gaulois (8C/-10C), A. Le Gaulois var. Astier (-8/-10C) and A. President Doumergue (-7C/-10C). They are multiplied only by grafting. In the Tanneron region, the Mimosa plantations consist of A. Mirandole (60%), A. Astier (10%) and A. Gaulois (30%). A. rustica (-8C/-10C) and A. Bon Acceuil (-9C/-10C). Acacia cardiophylla (-7C), colloquially (in Australia) called Wyalong Wattle. Acacia hanburyana (-4C/-8C), it flowers in great abundance, with grey/whitish leaves. Acacia floribunda (-8C/-11C), colloquially (in Australia) called White Sally Wattle, has creamy white flowers. All the above flower in the winter. A. Guillon, A. Imperial, A. Jean-Pierre, A. Layet and A.Lisette. Although this mimosa is sensitive to strong winds, as it has superficial roots, it is often used as a rootstock for other Mimosas because of its tolerance to chalky soil. When I planted my Mimosa Mirandole, four years ago (when I’d just arrived in the south of France), had I known all the above, I would have choosen a different Mimosa. I would have planted it in acid soil and would have chosen a sheltered spot. I did none of the above, in fact I gave my Mimosa a good bit of manure each year. Although the Mimosa has not died, because of its position it needs to be pruned quite a bit each year because of the die back due to wind damage and frost and consequently it has never flowered after the first year. The National Collection of Mimosas in France is held by Gerard Cavatore, quite near to us in Bormes-les-Mimosas (where else !). When we first bought our house here in 2004 there was a mimosa in the garden that had been badly pruned, but it flowered early each year. The scent was delicious, the bees & insects loved it – a real harbinger of Spring. One year when I returned from being away there was a gap in the tree line – it had been blown down in a Mistral, right from the very base which looked as if it had just sheered off !